The suffering of layer hens is a surprisingly large problem for many. In this explainer, we take a closer look at the cruel practices that hens are subject to in the egg industry’s fight for profit margins. The reality behind egg farming is far different than the cartoons of happy chickens on egg cartons try to tell you. Despite what a ‘90s television commercial might have led you to believe, eggs are for creating baby birds — not for human nutrition. The so-called “incredible, edible egg” is really an unfertilized cradle for a baby chick who wasn’t. And that’s the basis on which egg farming was born. Hens produce eggs in startling quantities. That’s why egg farming is so profitable. Their cycles sometimes take just one day, so they’re extremely productive. While these hens are laying eggs for human consumption, they’re kept in overcrowded cages and pens and suffer needlessly throughout their entire lives. That’s what the egg farming industry doesn’t want you to know. So, why does egg farming continue to inflict cruel conditions and neglect on hens? And what can we do to stop it? Egg farming is the practice of raising layer hens in order to harvest their eggs for human consumption. How much revenue does egg farming produce? In the United States alone, the answer is $8 billion. Nearly 40,000 egg farms exist in the U.S., and although industry growth has declined slightly since 2013, the sector still employs nearly 60,000 people. Proponents of the egg farming process will tell you that employment and economic necessity are strong enough reasons to continue farming eggs from defenseless chickens. However, when you consider that a laying hen’s egg production decreases by 65 percent within her first three years of life. When laying hens can no longer produce eggs, they’re slaughtered. They no longer have any value to the egg farmer, so there’s no reason to continue feeding them and providing them with space in which to live. This single sobering fact should give you pause the next time you reach for a carton of eggs at the grocery store. Egg farming might produce a lot of revenue, but are dollars worth millions of hens’ lives? How Much Money Do Egg Farmers Make? Egg farmers’ salaries and revenue depend on the size of their operations. For instance, a backyard homesteader will rake in far less money than a factory farming operation. However, the cost of eggs continues to rise. In 2011, one dozen farm eggs went for $0.79 but increased in price to $0.96 by 2013. Are Laying Hens Different From Broiler Chickens? Many people make the distinction between laying hens and broiler chickens as one of comfort and humanity. However, although broiler chickens are bred for slaughter and laying hens are not, their lives don’t look much different. Poultry farming is the farming of chickens for their meat. The animals are bred, genetically manipulated, fed too much grain, sometimes injected with hormones, and housed atop one another in their own filth. Laying hens face similar fates. They’re crowded with one another, often denied veterinary treatment, infested with fleas and ticks, and sometimes abused by their so-called caretakers. When they’re no longer useful, their lives are taken. The fates of laying hens in egg farming operations aren’t rosy at all. In fact, they’re frequently depressed, lame, and unable to care for themselves the way they’re instinctively made to do. What’s Morally Wrong With Egg Farming? You might know that vegetarians don’t eat meat, but they do eat eggs and dairy. That must mean that egg farming is a humane industry, right? In actuality, nothing could be further from the truth. Vegans do not eat meat, dairy, or eggs. In fact, they don’t consume any product that is produced with animal by-products, such as honey or tested on animals in labs. This means no leather, no fur, and no cosmetics that are first tested on lab rats. Vegans don’t eat eggs for a reason. A vegan believes that we, as humans, do not have the right to harvest animal by-products for our own gain. Additionally, veganism takes into account the way animals are treated. Did you know that laying hens often have their beaks and claws cut off? Factory farmers don’t want them to use these body parts to injure one another, which might seem heroic, but the process is painful and done without anesthetic. Additionally, chickens shouldn’t be ours to mutilate. A chicken uses her beak to peck food from the ground and her claws to find purchase on the ground. Without these body parts, she’s not only defenseless — she’s without important aspects of her anatomy. Plus, these operations don’t occur in sanitary conditions. When a hen gets her beak and claws removed, she’s left with an open wound. Bacteria and other infections can fester, causing her to be unable to eat or drink. Many laying hens die from these procedures alone. Every animal has its own unique way of keeping itself clean and healthy. Chickens, like other birds, participate in dust bathing, which is the process of rolling their feathers in dust, sand, or other fine silt to remove insects and dislodge foreign objects from their feathers. As you saw in the video above, laying hens don’t get dust baths. In fact, egg farming creates conditions in which these poor creatures can never even extend their wings. They’re caged tightly together after mutilation, resulting in dismal lives. Like other animals, chickens’ natural inclinations can be manipulated under the right — or, in this case, wrong — conditions. After laying hens stop producing eggs, farmers often starve them for two weeks or longer to “shock” their bodies into laying eggs again. Egg farming doesn’t care about chickens’ hunger or their survival instincts. The industry only cares about how many eggs it can produce for profit. No sentient creature should be starved of food or kept from water. Imagine living without food in stressful conditions for two weeks — or even for two days. You might become despondent, weak, unable to carry out natural bodily functions or communicate. The same thing happens to chickens in egg farming operations. Most of the laying hens become crippled before they’re even marked for slaughter. They have broken bones due to poor genetics or decreased bone density after starvation. Many of them have missing wings or tail feathers. Again, no animal deserves to endure such abuse. 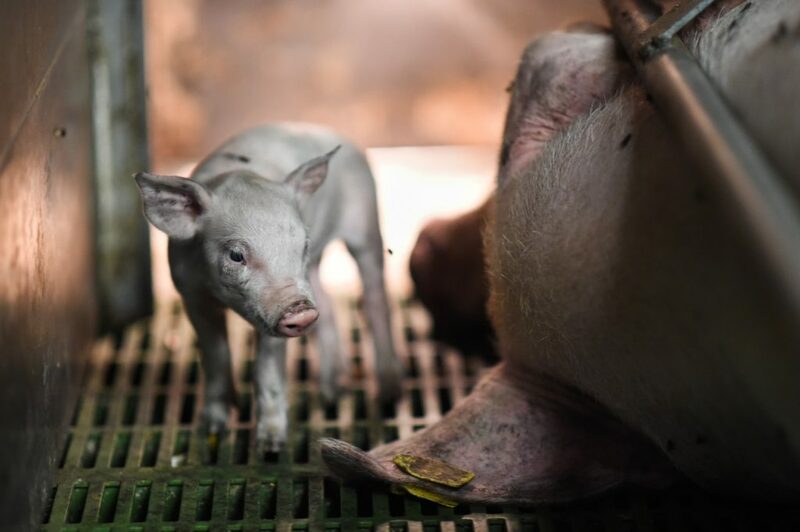 They’re in terrible pain every second of their lives because they’ve been mutilated and denied such as natural essentials as fresh air, good food, clean water, and veterinary care. It’s true that animals in the wild don’t see veterinarians, but that’s because human beings haven’t taken responsibility for them. Regardless of why we raise animals, it’s our moral imperative to take care of them, just as we do our dogs and cats. The slaughtering process for laying hens in egg farming operations isn’t much different from those in poultry farming businesses. These animals are strung up by their feet. They might get their throats cut, but many don’t die from that initial slice. Many of the birds are instead electrocuted or boiled to death in water. Their final moments are filled with pain and terror, surrounded by hundreds of other birds destined for the same fate. Aren’t Eggs Good for Humans? People who don’t see anything wrong with egg farming often claim that human beings need eggs. They’re considered a good source of protein and fat. Never mind that they’re loaded with insane amounts of cholesterol — and not the good kind. Still, many nutritionists still recommend eggs as part of a healthy diet. So why shouldn’t you continue buying and eating them? First, let’s distinguish between something that is potentially healthy from a dietary perspective and what is necessary for human health. They’re two different things. Beef, for instance, might contain vitamins, minerals, and macros that are good for our bodies, but does that mean we want cows to be slaughtered for our plates? Vegetarians and vegans say no, absolutely not. Similarly, most of us don’t want innocent chickens to suffer just so we can have scrambled eggs for breakfast. We don’t need eggs in our diets any more than we need beef or poultry. You might know that broccoli is good for you, but if you despise the taste, you don’t eat it. Imagine a large, barn-shaped structure filled from floor to twenty-foot ceilings with caged hens. The animals urinate and defecate on one another. Parasites run rampant, the animals have been mutilated beyond recognition, and the air inside is so poor that workers wear masks. Of course, the laying hens don’t get masks in egg farming operations. They’re forced to breathe unsafe air for their entire lives. The machinery used to extract eggs from nests and prepare them for shipment to supermarkets and other destinations produce obscene amounts of carbon emissions. Furthermore, the air quality around the egg farming business diminishes significantly, and the groundwater and soil in the surrounding areas become contaminated. If you care about creating a clean environment for the next generation, egg farming needs to stop. When chickens are raised in dirty conditions, serious bacteria like salmonella can develop in eggs and find its way onto human plates. It’s impossible to know whether a whole, uncracked egg contains harmful bacteria. It’s true that food-borne illness is more common in vegetables, such as lettuce, but that could result from animal contamination during the farming process. Additionally, egg farming increases the chances of eggs being diseased because of the filthy conditions. Following up on the fact that we don’t need eggs to survive, we also don’t have to deprive ourselves. If you just can’t imagine waking up in the morning without an egg in the frying pan, pick up an egg substitute. These substitute products are often healthier than the “real deal,” containing equivalent protein and good fat without the bad fat and cholesterol. Plus, you won’t even taste the difference. It’s simple math. When a chick lays an egg, just like when a human woman delivers a baby, there’s about a 50 percent chance of the chick being male. Since egg farming operations make money solely from farming eggs, male chicks aren’t of any value to them. These beautiful, innocent young chickens never even get a chance at life. They’re systematically destroyed with no thought to the lives they might have led if they were given the opportunity. The end isn’t easy, either. Many egg farming operations macerate the male chicks. This is a seemingly innocuous word that literally means the male chicks get ground up alive. No animal deserves such disregard for life. What About Organic and Free-Range Egg Farming? The organic and free-range labels you might see on egg cartons in your grocery store may give you a sense of relief. Look at the photos on the packaging of healthy, happy birds in large yards! That’s really not practical. The USDA doesn’t have stringent requirements for egg farming in free-range or organic settings. Yes, they’re required to allow laying hens access to the outdoors, but they’re not required to provide a minimum amount of space per hen, nor do the requirements specify the quality of food, water, or veterinary care. Indeed, according to PETA, free-range birds often experience the same abuses they endure in factory egg farming operations. They get debeaked and declawed. They’re left to wander in their own waste, they can’t socialize as they would normally do, and they don’t have enough space to take dust baths. These atrocities can occur even when the egg farming business labels their “products” as free-range or cage-free or organic. Don’t let the labels fool you. It’s easy to separate an egg on the shelf from a chick that might have been. The same goes for buying chicken breasts or thighs at the supermarket — those “products” don’t look like live chickens. If you study chickens for any period of time, however, you’ll discover that they’re intensely social creatures who care for their young, take care of one another, and roost together. Many people have backyard coops in which they keep beloved chickens as pets. These animals receive the same care as other pets, like cats and dogs. Humans can form bonds with chickens and the other way around. Indeed, many people who raise chickens as pets do so not to collect their eggs, but to have loyal companions. These animals have their own unique personalities that distinguish each individual from the collective. There are lots of debates about the merits and moral issues surrounding keeping livestock as pets. However, caring for birds in your backyard is far preferable to egg farming in unclean, abusive environments. What’s the Best Response to Egg Farming? If you want to help stop egg farming, campaign against it. Refuse to buy eggs, inform your social circle about these animals’ plights, and join animal rights groups to help lobby politicians and expose egg farming for what it really is. It’s easy to put your hands over your ears and turn a blind eye to what’s really going on at egg farms, but the humane thing to do is embrace it. Realize that it’s a broken industry — one that was broken from the beginning — and that egg farming contributes just as much to animal suffering as poultry farming, dairy farming, and similar enterprises. Don’t break any laws, such as trespassing, but speak up when you witness animal abuse. Let the authorities know, inform your community, and make sure that lawbreakers get investigated. Finally, use the Internet to amplify your voice. Share this article on social media, post about your lifestyle as a vegetarian or vegan, and encourage your social circle to educate themselves on egg farming. Who knows? You might save thousands of chickens by convincing people to stop buying eggs. Remember, egg farming continues to flourish only because profits exist. If we cut off the profits, we solve the problem. Maybe you eat lots of eggs, or perhaps you’ve abstained from eating them. Whatever the case, you can become part of the solution when it comes to egg farming. People have eaten meat, eggs, dairy products, honey, and other animal by-products for centuries. The industrial revolution created ways for the meat industry to hasten production and reduce the quality of life for laying hens as well as many other animal species. That doesn’t have to continue. In fact, it shouldn’t. We’re evolved enough as human beings to recognize suffering when we see it and to endeavor to stop it. It’s our moral obligation to speak up on animal matters and make humane choices no matter what. If you’re someone who loves eggs, here’s your challenge: Tomorrow, use egg substitute instead of a real egg. Just try it. You might discover that you won’t miss anything at all — and you can save helpless creatures in the process. What’s your biggest problem with the egg farming industry? Do you believe it’s inhumane?